Determine where you want the braid and knit your garment according to the pattern you wish...for example: place the braid at the waistline or near the edge of your sleeve. When you come to the point where the braid will be inserted into the garment piece, either turn off your row counter OR write down the row number so you can return at the end of this insert. You will be knitting from Right to left across the bed of your machine. 1. Decide how many stitches you will use for each loop of the braid...3 4 or 5 stitches (thicker yarn will not require as many stitches as thinner yarns). 2. Also, reserve 2 stitches on each edge for seaming. Remember to include these in your planning. 3. For this example we chose 4 stitches. 5. Knit 1 row to left and pull the far right 2 stitches to hold (these will be for the side seams and are not part of the braid). Knit 15 more rows on these 4 stitches. ***6. COR Push the next 4 stitches into upper work and knit 1 row to the left on these 8 stitches. 9. COR push the last 2 stitches to upper work and knit across to the left on these 6 stitches. 10.. COL Take hold button off and knit 1 row to the right on all the stitches. This trim takes a bit of planning to get it where you want and how you want. 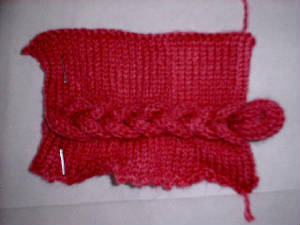 You will need to decide how steep the diagonal must be, anotherwords2 rows for every loop of the braid or 4 or ??? This example is 4 rows and seems to work nicely. Your braid will work diagonally across the bed and your knitting starting on the right of the bed. **3. Place all the stitches on Left back in work, Knit I row to the left. 4. 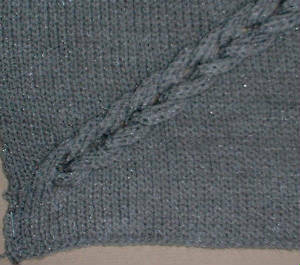 Place the first 4 stitches on right (as well as the very first 2) in hold. Knit 3 more rows on the rest of the needles in work. 9. COR Place carriage back in hold. Pull all needles to hold. Put the first 6 needles back in work, knit 4 rows on these 6 needles. 11. Repeat from **** to **** across the bed.